Please submit your orders asap so I can guarantee that it'll make it to them by December 25. Thanks to all and safe hunting! 1. "RE: Showpiece Prints...Christmas Gifts"
Thx for the heads-up. I'll be in touch. 2. "RE: Showpiece Prints...Christmas Gifts"
Looking forward to it Grizzly it'll be AWESOME!!! 3. "RE: Showpiece Prints...Christmas Gifts"
I uploaded pics to your website. I look forward to seeing what you come up with. Thx. 4. "RE: Showpiece Prints...Christmas Gifts"
Hey Grizzly I just got it bro and emailed you! Get ready for something AWESOME!!! 5. "RE: Showpiece Prints...Christmas Gifts"
Roland is a true artist when it comes to showcasing my hunting pics! I let him work his magic on all of my trophy pictures. It�s easy to send him your hunting pics, he takes the time to talk to you about your hunt and what your ideas are for a truly custom print. I guarantee you�ll love your print! I love looking at my trophy on the wall as well as my trophy shot picture next to it! 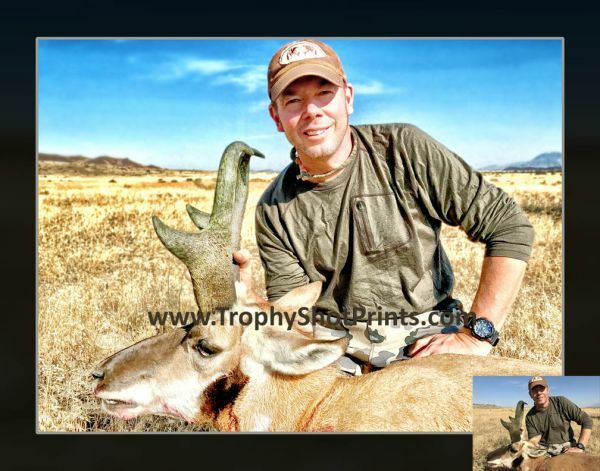 Go to Trophyshotprints and give him a try and you won�t be disappointed! 6. "RE: Showpiece Prints...Christmas Gifts"
Roland has been awesome. He called me and emailed me multiple times to make sure I got what I wanted and sent me a proof tonight that was better than I had hoped. I can't wait to see the finished product. 7. "RE: Showpiece Prints...Christmas Gifts"
Just sent off my pictures! Excited to see the final product. 8. "RE: Showpiece Prints...Christmas Gifts"
When UPLOADING your photos please leave me as much info/details you can and most especially the SIZE you are interested in ordering in the comment section. When I review your photos I will then make my recommendations if we need to go smaller based on image quality, etc. In other words I won't hold you to it...but I like to do my edit/design on the actual print size from the get-go as it'll be of better quality in readying it for the actual printing process. 9. "RE: Showpiece Prints...Christmas Gifts"
THE CHRISTMAS RUSH IS NOW IN FULL SWING!!! At this time last year we've exceeded our production a hundred-fold. Thanks to all and a friendly reminder if you're interested in these arriving by Christmas as gifts please get the orders in asap so you are in queue. I don't rush any of my images during the design process,,,and it's first come first serve..I do NOT accept offers of more money to rush/expedite orders and skip to the front of the line. We treat every member of THE TROPHY SHOT PRINTS FAMILY with the same quality service regardless if its a $200 order or a $2000 order. HAPPY HOLIDAYS AND SAFE HUNTING!!! 10. "RE: Showpiece Prints...Christmas Gifts"
11. "RE: Showpiece Prints...Christmas Gifts"
I won a piece from this site of my goat hunt and Roland also do a Mexico Coues photo for my office. Both are one of a kind and great!. Thank You so much! 12. "RE: Showpiece Prints...Christmas Gifts"
I just received the showpiece Roland created for my father, and it turned out awesome. I had a little discrepancy with what I wanted, compared to what the showpiece ended up being. Roland was awesome to work with making sure the final product was exactly what I wanted. I will definitely have him do future works for me. 13. "RE: Showpiece Prints...Christmas Gifts"
Sliver...as you have experienced it's all about my PASSION! My passion to put my heart into each piece that I create and to provide my client's with the very best professional courteous, polite service that money cannot buy...for it comes from a person's integrity of character. I love making people happy and exceed their every expectation always...even it may be to my expense I will do it!!! God Bless You brother and look forward to doing more work in the future...I love the showpiece I created for you and your family! 14. "RE: Showpiece Prints...Christmas Gifts"
I've posted this info just to give other potential clients an idea of the delivery time frame if they are giving these as Christmas Gifts. Happy Thanksgiving and Safe Hunting to all!!! 15. "RE: Showpiece Prints...Christmas Gifts"
I got my print from Roland and it is awesome. The quality and service is second to none. 16. "RE: Showpiece Prints...Christmas Gifts"
17. "RE: Showpiece Prints...Christmas Gifts"
We had Roland do a print for my grandpas ram he got this year. It turned out far better then we ever imagined. Roland was great to work with and makes sure that all of his work is perfect! I would highly reccomend this to anyone looking to capture the memories of that hunt and be able to relive them with such a cool peice of art. 18. "RE: Showpiece Prints...Christmas Gifts"
A BIG THANK YOU for the SHOUT!!! Very kind of you brother!! !